Atmosphere/Decor: Elegant ballroom with high ceilings, beautiful chandeliers and a private outdoor patio. Spacious pre-function area for the Crystal Ballroom. Open area with lots of windows and natural light. The Palm area is great for your cocktail reception, meeting break stations and exhibitors. Casual poolside beach themed bar. Available for private events. 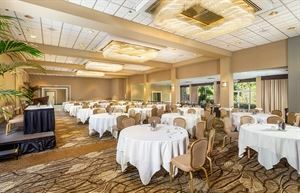 Spacious pre-function area, leading to the Presidio Ballroom. Great for registration, exhibitors, breaks and cocktail receptions.